Learn how subprograms can be created in other languages. PL/SQL developers often create code that is utilized by web based or desktop applications. In a client/server environment, each client application makes a connection to a server. In some cases, this can be a direct connection to a database server itself. Many applications today are multi-tiered and include client applications, one or more middle tier servers and Oracle databases as the backend data store. In web based applications, the web browser is a client application, a web server (along with various application servers) comprise the middle tier, and the Oracle database is data store. It is important to identify the way an application is partitioned early on in the design process. The architecture selected will determine to a large degree what program functionality is required in each section of the application. For instance, a Model-View-Controller pattern is often used to separate concerns in middle tier development. In this paradigm, the Oracle database provides the model data in raw form. Formatting is done by the view. Interactions between the model and the view are coordinated by the controller. For a PL/SQL developer, the use of such a design would suggest that very little formatting would be done in PL/SQL code. Values would instead be returned in the data type and precision that they are stored. There are times when PL/SQL cannot be used to effectively accomplish a programming task. Although these concerns are not very common, Oracle has provided the ability to extend database functionality beyond what is possible in PL/SQL. Most recent Oracle Versions (other than the free Oracle XE database) include support for writing PL/SQL programs in other languages including Java and C. The use of this functionality requires special administrative rights and configuration. In addition, the use of these features requires both an understanding of the language being used as well as implementation limitations and idiosyncrasies for the implementation used by the Oracle database. Part of the appeal of using Java is due to its classification as a Object Oriented (OO) language. Oracle has added object oriented programming features to the database and PL/SQL as well. The following demonstration shows how an object can be defined, constructed and accessed. By creating an object type a class is effectively defined. This class will have attributes as well as associated behaviors (subprograms). This object type is simply a specification. Like packages in PL/SQL, the implementation of the object is separated from its definition. The type body contains the actual implementation of the type previously defined. The table created will hold specific instances of our class. This script demonstrates the creation (or instantiation in OO terms) of two person objects. An object's attributes can be queries and functions called via SQL queries. The VALUE function returns object instances corresponding to selected rows of the table. When no longer needed, object tables and definitions can be removed using a drop statement. The force option may be required if there are any object dependencies. Oracle SQL provides an extensive array of statistical capabilities available through functions that can be called in the context of SQL statements. PL/SQL provides even more statistical power through the DBMS_STAT_FUNCS package. 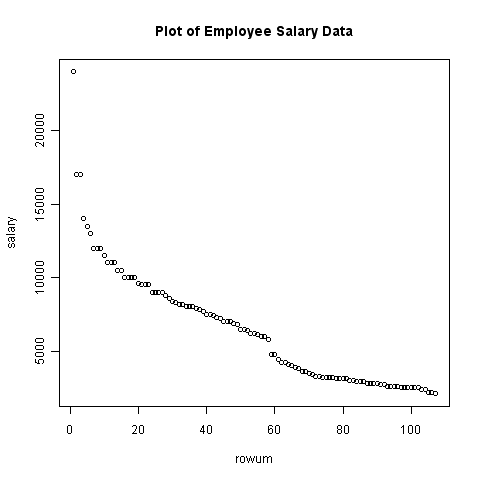 This demonstration illustrates how to retrieve basic summary statistics using SQL. The DBMS_STAT_FUNCS package can be used to retrieve the same information as a single type. The package goes beyond these simple descriptive calculations. Data can be plotted in a way that suggests a shape: There are several procedures in the package that quantify the degree that a data set conforms to an identified distribution. Statistical techniques have been combined with insights from Machine Learning and other areas of Computer Science to provide sophisticated means for classifying data and making predictions based upon sample data sets. These techniques are often referenced under the heading of Data Mining. Oracle has an optional Data Mining package that provides standard algorithms that support this kind of analysis. They also have a front end application (Oracle Data Miner) that provides an organized user interface that facilitates this work. Create an object type named car_typ. It should include the attributes for id (NUMBER), maker(VARCHAR2), model_name(VARCHAR2), year_made (NUMBER) and miles per gallon (NUMBER). It should include functions to get the id and a string representation of an instance, as well as a function to determine the age of the car (in years) and the gallons needed to drive a given number of miles. Create the implementation for the car_typ listed above. Create a table named car_obj_table to hold instances if this class. Create a car instance with id set to 101, maker set to Ford, model_name set to Torino, year set to 1971, and miles per gallon set to 11. Create a query to select the maker, model, age and gallons needed to travel 22 miles for the instance created. Remove the car_obj_table and type car_typ.